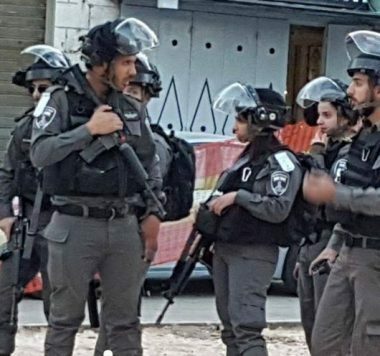 Israeli soldiers invaded, on Wednesday, many homes in various parts of the occupied West Bank, and violently searched them, before abducting at twenty-two Palestinians, including children, the Palestinian Prisoners’ Society (PPS) has reported. On Wednesday morning, the soldiers abducted a college student in Bethlehem. The PPS said that the soldiers invaded many homes in several parts of the West Bank governorate of Bethlehem, and abducted eight Palestinians, identified as Bilal Khader Salama, 24, As’ad Darwish, Mo’men Malash, Mohammad al-Asakra, Awad al-Asakra, Adam Eyad al-‘Amour, 17, Mahmoud Salem al-Badan, and former political prisoner Yasmin Abu Srour. In occupied Jerusalem, the soldiers also invaded and ransacked homes, and abducted five children, identified as Rawhi Mo’taz al-Mobabber, 14, Khader Salam Abu Ghannam, 15, Mohammad Ali Abu Ghannam, 15, Mo’men Taha al-Ghaleeth, 17, and Khaled Shalabi, 15. In Hebron, in the southern part of the occupied West Bank, the soldiers searched many homes, and abducted Ismael Maher Sharif, 16, and Qussai Ayman Teety, 16, from the al-‘Arroub refugee camp, north of the city. The soldiers also invaded the al-Fawwar refugee camp southwest of Hebron, and Rabud city, south of the city, and withdrew later without abducting any Palestinian. Also, the soldiers abducted a university student from Ejja town, south of Jenin, after stopping him at the “Container” Israeli military roadblock, northeast of Bethlehem, while he was heading to Polytechnic University, in Hebron city. In addition, the soldiers invaded ‘Allar town, north of the northern West Bank city of Tulkarem, and abducted a young man, identified as Mohammad Salim Majadba, after invading his home and searching it. Another Palestinian, identified as Abdul-Rahman Nasouh Eshteyya, was abducted after the soldiers invaded and searched, his home in Salem village, east of the northern West Bank city of Nablus, and illegally confiscated his car. Furthermore, the soldiers abducted Daoud Omariyya, from his home in Jenin, in northern West Bank. In Ramallah, in central West Bank, the soldiers abducted Hamada Abu ‘Arab, Mohammad al-‘At’oot and Amir Mousa Reehan, after invading their homes and searching them.